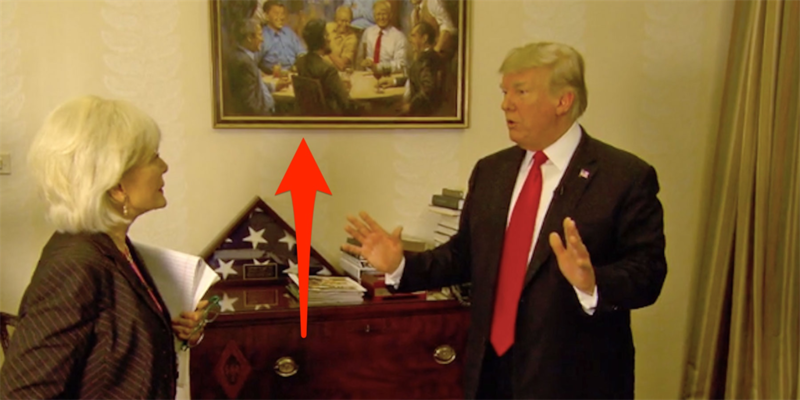 The painting could be seen behind President Donald Trump in the White House on "60 Minutes." 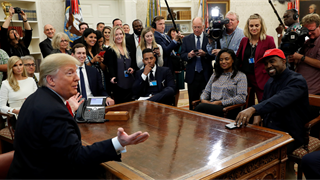 President Donald Trump has decorated the White House with a painting of him hanging out and laughing with former Republican Presidents, including Ronald Reagan, Teddy Rosevelt, and Abraham Lincoln. 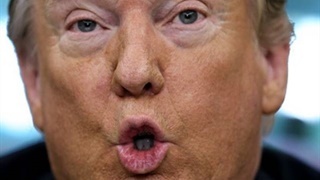 Artist Andy Thomas told the Daily Beast that Trump had called him and was "very complimentary" - "He made a comment that he'd seen a lot of paintings of himself and he rarely liked them." Thomas wrote on his website that the painting has a "subtle feminist message" and that he found it hard to give Trump a "genuine smile." Thomas makes a similar version of the painting with Barack Obama and Democratic presidents. President Donald Trump has hung a painting depicting a fantasy scene of him hanging out with former Republican presidents in the White House. The scene shows Trump sat between Dwight D. Eisenhower and Richard Nixon, and looking at Abraham Lincoln, who is directly across from him. Ronald Reagan, Gerald Ford, Teddy Roosevelt, Dwight Eisenhower, and both Bushes are also laughing and drinking in the painting. The painting could be seen in Sunday night's episode of "60 Minutes," which interviewed Trump at the White House. The painting, called "The Republican Club" is by artist Andy Thomas, who reacted to seeing his painting on the White House wall on Facebook. "Wow, during the 60 Minutes interview this evening look what is on the wall!" he wrote. Thomas wrote on his website that the painting has a "subtle feminist message" due to the woman in the background walking towards the table. "As I was doing the painting, I was thinking that these guys are kind of intimidating in a way. That's the kind of woman that will be our first woman president; she'll walk right up to that table," he wrote. He also said that he found it hard to give Trump a "genuine smile," and had to redo the painting after his first take seemed off. Thomas told the Daily Beast that Trump had called him to say how much he liked it. 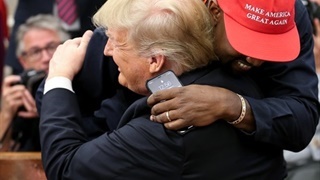 "He had actually given a me real gracious call to tell me how much he liked it," he said about Trump. "He was very complimentary. He made a comment that he'd seen a lot of paintings of himself and he rarely liked them." TIME reported that Trump, who doesn't drink, is depicted as having a Diet Coke in the scene. According to the Daily Beast, Rep. Darrell Issa, a Republican, gave Trump the painting. It retails for more than R2,000, depending on the size and edition. Thomas' website also offers an almost-identical version of the painting called "The Democratic Club," where Barack Obama is sitting where Trump sits in the Republican version.